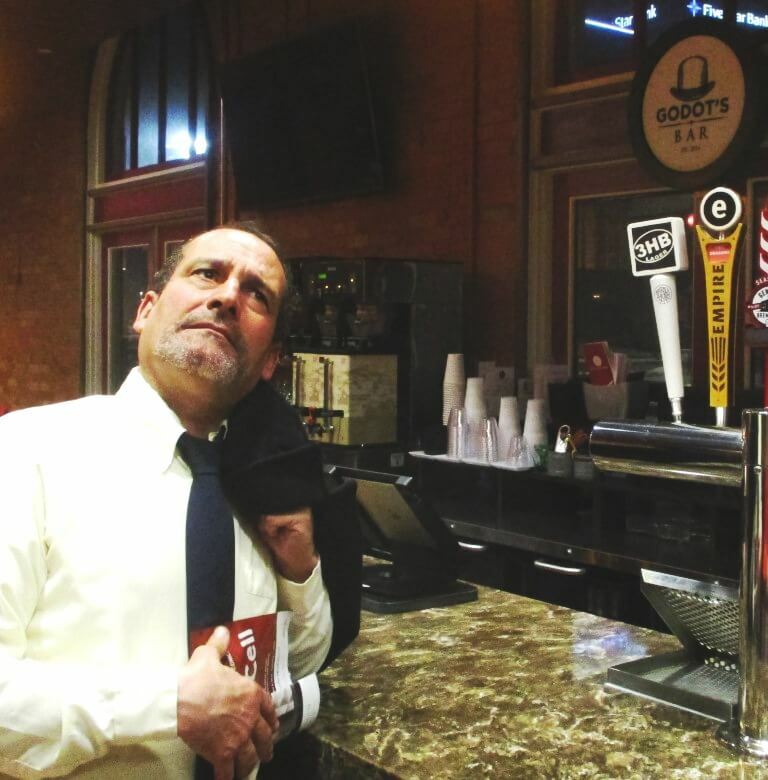 As seen in Talker has two tickets to Geva. 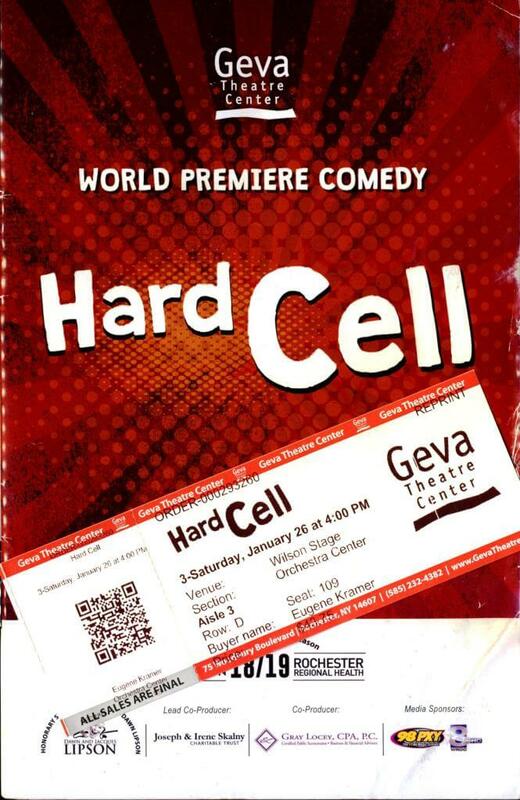 Seeking connoisseur of the arts, our friend Bruce Kay kindly answered the fundraising drive by donating two tickets for the performance of Hard Cell at Geva Theater. Our mutual friend Dean gladly accepted Bruce’s generosity. Season ticket subscribers, the Tuckers at Geva, 1/26/19. Donald said, “After digesting the experience, we were put off to a degree by the element of racism as basis for the humor. We wonder how it would have been received if the protagonist were black, exploiting anti-black fears, rather than middle eastern.” Lois mentioned there was a little too much filler or tangential lines (I agree). As this is the world premier of the play, Lois anticipates the script will be further tightened and honed. Unbeknownst to Bruce, I already had a ticket. So — for the first time — I went twice to a Geva performance. 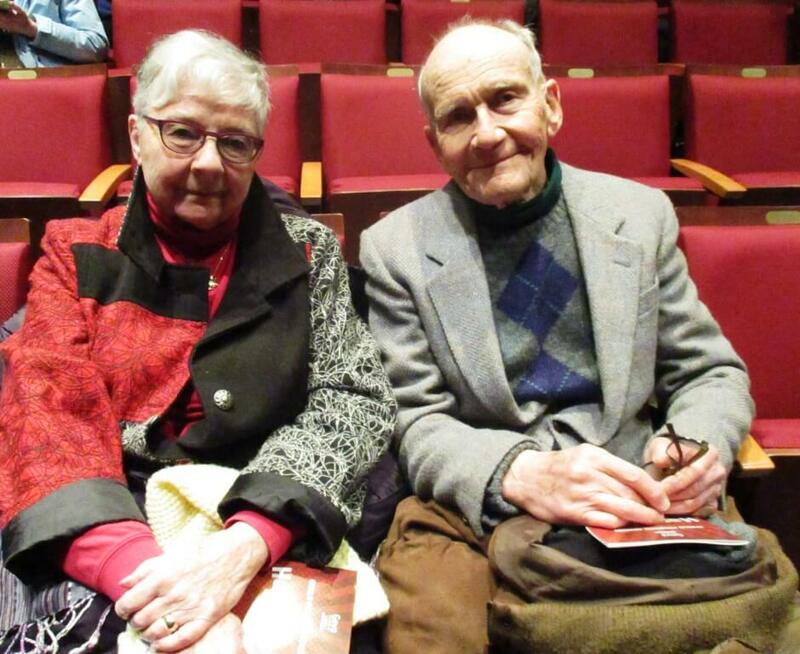 On the second occasion, by pure coincidence, I sat directly in front of Dean’s parents, Lois and Donald Tucker. It’s a small theater world. 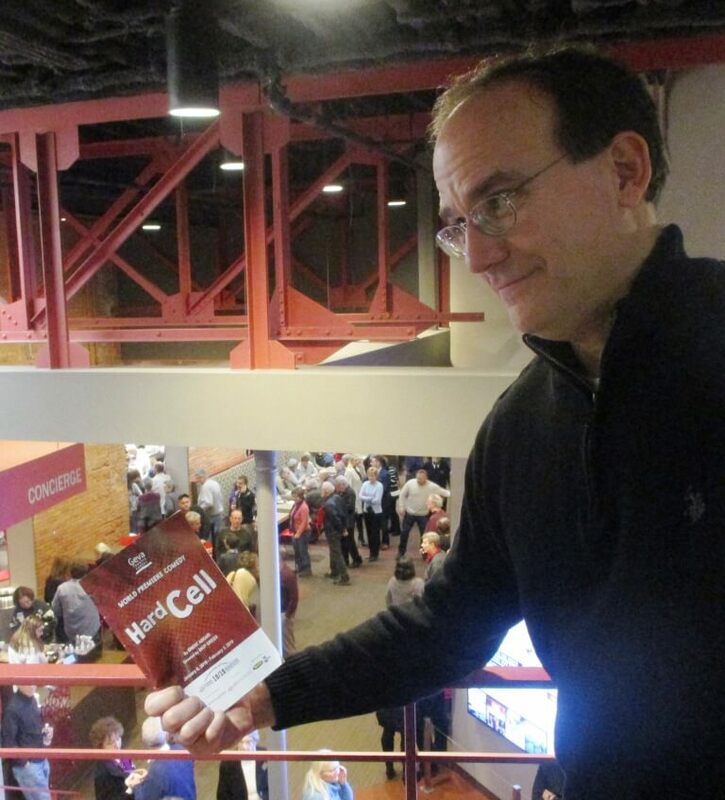 Hard Cell is the story of D.C-based community college English and creative writing professor Nick Abtahi (Nuah Ozryel) who finds himself stranded in a small middle-America flyover town while on a road trip to visit his ex-girlfriend in California. Nick — “the only brown person in town” — is suspected of being a terrorist. Part of an elaborate escape plan, Nick masquerades as the leader of the improvisationally-named Islamic State of Terror bent on jihadism. His mother a Persian Christian and his father a Persian Muslim, Nick is a “kind of an atheist” and a quintessential representative of liberal, secular, coastal multiculturalism. The second viewing afforded me the chance to closely watch Ozryel’s dramatic gyrations as he shifts back and forth from a mild mannered professor to the head of a faux terror cell. As an English professor myself, I imagined Nick as a frustrated creative writer himself, one loaded down with student essays and short stories. For anyone who has struggled with a difficult semester, when Nick — apparently wearing a suicide vest — tells another character he is a college teacher, the response, “Wow. Do you really hate your classes that much?,” hits home. At the same time, perhaps for the first time, Nick’s own creative powers are suddenly and unexpectedly tested. Through distinctive facial gestures, Ozryel masterfully transforms Nick from a diffident and unintended actor in the play-within-the-play to almost the commanding playwright himself as — along with his sidekick, Jane (Vanessa Morosco), a local bartender — Nick orchestrates the comedy-within-the comedy. When Nick reverts to his ordinary mild mannered community college professor self, we almost forget that it is Ozrvel playing that role-within-the-role. Nick and Ozrvel receive an A in Acting/Writing 101. During the time between performances, I read several reviews. In Hard Cell at Geva Theatre (broadwayworld.com), Rochesterian Colin Fleming-Stumpf’s observations very closely matched my own immediate impressions. Hard Cell caricaturizes middle-Americans (and though it’s never overtly stated, Trump supporters) as cartoonish rubes who can barely pronounce the word “Muslim,” much less understand that they’re not all radical terrorists. It condescends when it should be finding common ground, and it makes enemies of precisely the audience members that, with a little more sympathy and gradation, it could be winning over. At my second viewing already knowing the outcome, I scribbled down instances where — though sometimes subtly in offhand comments — the caricatures appear. The jibes are aimed at the local goon Evan (Patrick Noonan) and the town’s overzealous Sheriff Terry (Jennifer Cody). Throughout, Evan is presented as a product of right wing talk radio — and less overtly — fake news websites. Throughout, Nick toys with Evan as yet another ditto head moved by the rants of hosts like Michael Savage. Portraitured as the epitomy of nativism and paranoid patriotism, Evan — proudly declaring himself a “White Christian American” — becomes a negatively-rendered symbol of conservative talking points. The set is back dropped (satirically) by the Stars and Stripes. At every opportunity Evan will fist bump in the name of the USA. 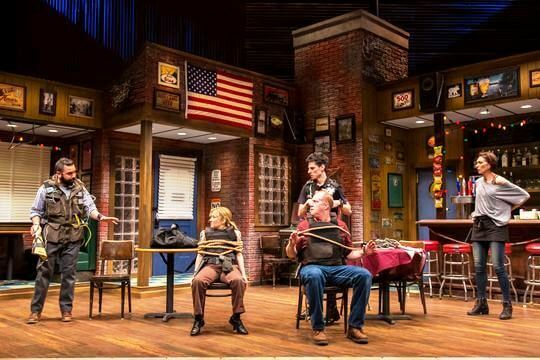 That well constructed set of the townie bar is foregrounded with a sign: No Stupid People Here — tempting us to guess how the playwright views these Midwestern yahoos. Garnering audience laughs, Evan spouts off about the Washington government bureaucracy supporting “welfare queens” whose law agents are fearfully referred to as “the Feds.” Evan’s attempts at political philosophy are dismissed when he equates the Islamic terrorists hatred “of our freedoms” with a defense of American ice cream or admits he pawned the phrase “With great freedom comes great responsibility” from Spiderman. At one point, Evan — echoing conservative talk radio — declares he must take personal responsibility to counter the supposed terror cell, getting laughs because the terror cell does not exist. The farcical structure of the play glosses over the possibility that Evan — in all his Islamophobia — might actually be following the guidelines of Homeland Security in the aftermath of 9/11: If You See Something Say Something. At closure, Evan and Terry, unreconstructed and unrepentant, are expunged and removed. The town’s two characters offended by the goon and the cop — Jane the independent woman/bar tender and Derek the weird but enlightened young goth (performed brilliantly and dead pannedly by Sean Patrick Doyle) — are on their way out of this Dodge. The unnamed Red State hick town seems to have gotten what it deserves. Given that I am more or less liberal, secular, cosmopolitan and (semi) coastal, my first reaction to the caricatures was reflexive approval. I applaud when Islamophobia and right wing talk radio are confronted in dramatic discourse. Fleming-Stumpf feels similarly when he says, “I suspect that my personal politics align pretty closely with Askari’s” — as I suspect do mine. But, like Fleming-Stumpf, I wonder how Hard Cell would play not in Rochester — and even more so in Toronto — but in DeMoines where Hard Cell‘s caricatures might feel unforgiving. SEE Talker has two tickets to Geva. Seeking connoisseur of the arts that includes the full Geva series.